Da Capo, a cappella group, will be performing in All Saints’ Church, Burton Dassett this Sunday. 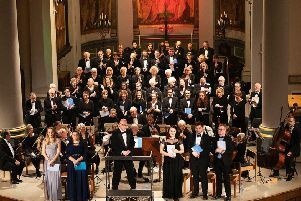 The choir was formed in 2007 by John Adams and has gone on to establish a considerable reputation for fine cappella singing. The choir will start their performance at 3pm with a selection of sacred and secular choral music. Tickets are still available for £15 which includes tea and cake with proceeds going to the church fund. Call Gill Roache 01295 680309 for information. Click here to find out more about the choir and hear them sing.